Still don’t own a Blu-ray player? If not, you’ll have four more reasons to get one as of Friday: Luke, Han, Leia, and Darth. 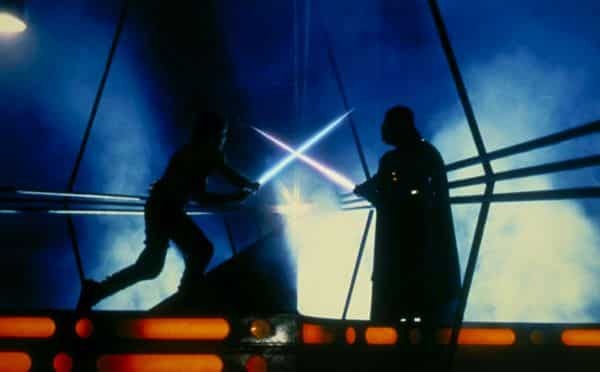 Yes, the original Star Wars movies—”A New Hope,” “The Empire Strikes Back,” and “Return of the Jedi”—will make their long-awaited debut on Blu-ray this Friday, along with the iffy prequels (the dreadful “The Phantom Menace,” the so-so “Attack of the Clones,” and the pretty-good “Revenge of the Sith”) from a few years back. The classic Star Wars trilogy—or at least the “Special Edition” versions, which include a host of controversial tweaks and changes by the ever-meddling George Lucas—has been out on DVD since 2004, but the arrival of the Blu-ray versions marks the first time that the saga has been available on home video in glorious, full-on HD. Now, in the interest of full disclosure, I’ll just come out and say it: I love Star Wars. Love it. I saw the first movie when I was seven, and I barely remember a time when I didn’t know who R2-D2 and C-3PO were. I can’t even objectively tell you whether the original Star Wars is a good movie, or whether the special effects in “Empire Strikes Back” look dated. The new Blu-ray version of “Star Wars” reveals just how grimy the cabin of the Millennium Falcon actually looked. So it probably shouldn’t come as a surprise that I went ahead and pre-ordered the complete Star Wars box set ($139, or $80 if you shop around online), and when the discs came Thursday—a day early—I immediately pounced and queued up my favorite scenes to see how they’d look in crystal-clear, 1080p-quality HD. No, I haven’t had time to sit through all six movies yet—hence the “first impressions” title of this post. Alright then, how does Star Wars look on Blu-ray? Initially, I didn’t notice a huge change from the DVD version: the famous opening title card (“A long time ago in a galaxy far, far away”) and crawl (“It is a period of civil war…”) look bright and sharp, as does the first sight of the gigantic Star Destroyer rumbling over the top of the screen … yet the Star Wars DVD from 2004 looked reasonably sharp, too. So no, I wasn’t initially bowled over. But here’s the thing when it comes to Blu-ray: it’s the delicate, razor-sharp subtleties that eventually start to amaze you. During the scene where the evil Stormtroopers blast their way onto Princess Leia’s fleeing star cruiser, I noticed the whiskers on the chins of the Rebel soldiers, the dents on R2-D2’s battered shell, the scuffs on the walls and hallways. A little later, I saw—probably for the first time in decades—how grungy the cabin of the Millennium Falcon really was. Indeed, one of the most memorable things about Star Wars isn’t so much the space battles or the special effects, but how lived in everything looked—a key detail that’s easy to miss on DVD or VHS. That’s not to say the special effects in Star Wars don’t look spectacular on Blu-ray. I wasted no time in dialing up the two most thrilling sequences in the entire saga: the Millennium Falcon’s escape from the Death Star in Star Wars (featuring Luke and Han seated in a pair of spinning gun turrets, firing laser bolts at a squadron of pursuing Tie Fighters), and the jaw-dropping march of the towering Imperial Walkers on the ice planet Hoth. And yes, the two scenes look wonderful—in part because the original special effects have been left mostly untouched by glib digital enhancements. Yep, the Imperial Walkers in “Empire” still lurch around thanks to the jerky wonders of stop-motion animation (“Jason and the Argonauts,” anyone? ), while the Tie Fighters from Star Wars still look pretty stiff while they’re flying in formation. Overall, though, these 30-year-old effects still give me the chills, and I’m thrilled that they’ve been preserved as-is. The Imperial Walkers: still big and scary, after all these years. I also gave the more recent Star Wars prequels a quick look, and they too look spectacular — perhaps even a little too perfect, if you ask me. With all its grit and scruffiness, the universe of the original trilogy looked like a place where real people lived and breathed. The soulless digital perfection of the prequels, on the other hand—particularly the last two movies, “Attack of the Clones” and “Revenge of the Sith,” which were shot entirely with digital video cameras—looks a little too synthetic for my taste. But hey, maybe that’s just me being middle-aged and grumpy. It’s also worth noting that you can buy each trilogy on Blu-ray separately, for $70 each. Of course, not everything in the Star Wars saga has been left untouched by the never-satisfied George Lucas, who first began tweaking various scenes in the movies more than a dozen years ago. For instance, there’s the now-infamous “Greedo shoots first” sequence from Star Wars, in which Han Solo now blasts a green-skinned bounty hunter in self defense rather than ruthlessly taking the first shot. Several other scenes have also been “enhanced”—for better or worse—with new digital effects, some of which now look ironically dated. The tinkering continues in this new Blu-ray set, with two changes to “Return of the Jedi” drawing a fusillade of criticism from fans: the plastic, sewn-in eyes of the adorable Ewoks on the forest moon of Endor now “blink” (yes, it’s strange, but not horribly distracting), and Darth Vader now yells “No!! !” as he tosses the dastardly Emperor to his death — a cheesy, snicker-provoking change. The all-digital prequels, such as “Attack of the Clones,” look perfect—almost a little too perfect. Believe me, I truly wish George Lucas would leave well enough alone when it comes to Star Wars. But while some hard-core Star Wars fans will probably boycott the Blu-ray discs thanks to Lucas’s latest tweaks, I’m certainly not asking for my money back. The complete box set of Star Wars movies also comes packed with multiple audio commentaries and three (yes, three) bonus discs filled with documentaries and other extras, none of which I’ve really checked out yet. You can read all about them here. I did switch on the Star Wars commentary track for a few minutes, only to doze off as George Lucas drones on about myth-making and his thoughts on Joseph Campbell. Ah, let’s just get back to those lightsaber duels, shall we? All in all, the new Star Wars box set is pretty much a must-have for movie lovers, not to mention the perfect reason to finally break down and snag a Blu-ray player. And now, you’ll have to excuse me; I have an appointment on Yoda’s home world of Dagobah. Looking for home video tips and how-tos? Click here!